Black Wing Shooting Center's 20-station Sporting Clays course was designed with the recreational shooter in mind. Nothing was spared to create a state of the art experience, in true Black Wing Shooting Center 5-Star style! It is an ideal course to learn the sport, practice for tournaments, work on those duck and pheasant shots. Shooting Sporting Clays is a very social event so bring your corporate teams and clients out for some fun. Getting married? This will be a great part of your bachelor or bachelorette party you will always remember! And best of all, if you like to fly solo, our course technology allows the individual to shoot the entire course on their own, without the need for a puller or coach to guide you through the course. Shoot one station or all 20 at your own pace and of your own choosing. 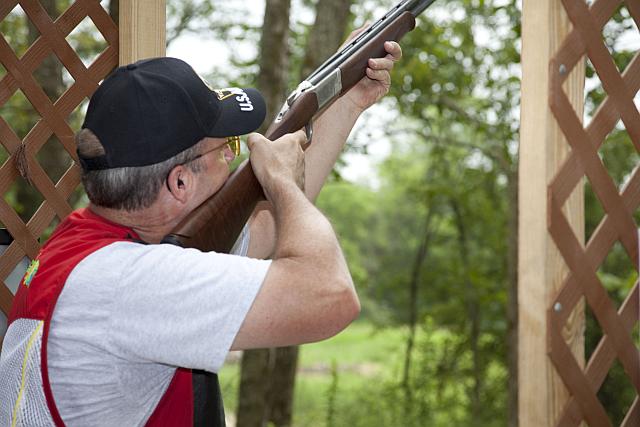 Sporting Clays is the fastest growing venue in the clay target sports world. The way targets are presented to the shooter, varies at each station. As an example, some targets will cross in front of you, some will come from behind you, others will spring straight up, while still others will bounce on the ground. Each of our 20 stations will have two different target presentations. When are ready to shoot, you will load two shells and then call for your targets. Depending on the station you are shooting from, you may have 2 targets thrown individually when you call for them, this is called a Rapport pair (the second target is thrown as the first shot is fired). You may also have a True pair, in which both targets are thrown simultaneously. Each station has a placard to show how many shots should be taken from that station and the way the targets should be thrown. When you're ready for a bit of a challenge and a whole lot of fun, Black Wing Shooting Center won't let you down! Long gun shooters under 18 years of age must have the approval of, and be accompanied by, a parent or guardian at all times while on the range. Always keep your firearm unloaded, your finger off of the trigger, and the gun pointed in a safe direction until ready to shoot. Never pass a loaded firearm to another person. Always keep the action of your shotgun OPEN when walking to the field and in between shooting stations. Only move with an unloaded shotgun with the action open. Eye and ear protection must be worn at all times on the outdoor ranges. Never shoot on a field when an orange cone is in front of a station. Do not load your shotgun until it is your turn to shoot. Unload immediately if a Range Officer tells you to do so or if another shooter has a malfunction. Load only TWO (2) shells at a time. If unsafe behavior is noticed, please make sure that the Range Officer is notified of such behavior immediately. Commands issued by any Range Officer must be followed immediately. Range Officers are authorized to remove any shooter whose behavior is detrimental to the safe operations of any of the ranges.